I purchased the Troy Bilt self-propelled mower 4 months ago and overall I have been very satisfied with it. Assembly was almost non-existent as the only thing I needed to do was open the handle and screw it down. A full amount of oil is included in the box. After this you must let the electric starter charge for approximately 8 hours before you are able to use it. This can be sped up by using the manual pull if you don't want to wait. You must also pull the collector bag around the outside of the bag frame. This is one of the only annoyances as the bag will sometimes slip off the frame and shoot some grass in your direction. It starts very easily with the electric start and running surprisingly quietly with a motor of this much power. This is also one of the only things that may catch someone off guard as this mower can go extremely quickly when being self-propelled. Most smaller people will not want to use above 2 speed. The quality of cut is excellent and cleanup is a snap. 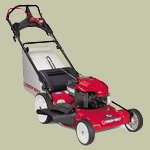 Overall this is an excellent quality mower that comes almost fully assembled and requires no tools to get going.